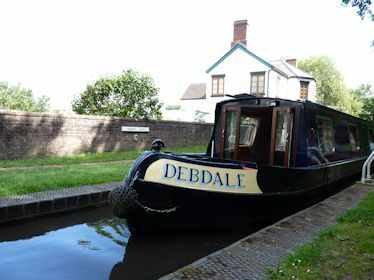 Built in 2006 Debdale is a private shared ownership narrow boat. Built of steel, she is 58 feet long and 6 feet 10 inches wide and can sleep up to six people in three double beds. She has a 44hp Nanni diesel engine to provide motive power and to keep her batteries charged. She also has a hydraulic bow thruster to help manouver in tight spaces. Inside she is well equipped with all the necessities of modern life including a fitted kitchen, central heating, solid fuel stove, bath, shower and hot and cold running water. In fact she is so well equipped that her owners do not hesitate to take her out in all weathers secure in the knowledge that she will keep them warm and comfortable at least when in the boat! Some of the owners have been involved since Debdale was new and some have bought in to the syndicate later as existing members have moved on to other things or are no longer able to enjoy boating. All the owners take an active part in running the boat and the various jobs are shared out so no one person has too much to do. This website has two purposes. Firstly we would like to share with you some of the pleasure of exploring the canals in this lovely boat. Secondly we are providing a central point where the owners can share information and feedback with each other and provide a central information and document library. Website created by Blythweb Ltd. Website hosted and maintained by MHCreations. All images are copyright of the members of the Debdale Syndicate and may not be used elsewhere.